I hope everyone had a lovely Valentine's day! I personally don't like going out to celebrate because everywhere is packed, so instead we celebrated last weekend with a nice dinner at Asia De Cuba while the in-laws babysat and the day of Valentines we cooked dinner at home. It makes the day a lot more tolerable for us. I think Valentine's carries high expectations and it's better to keep it low key. I'm more of a fan of the "every day is Valentine's day" point of view. I've been on a holo kick lately because I'm anxiously anticipating the new Hologlam collection that's due out this spring by China Glaze. To appease my excitement somewhat, I pulled out a China Glaze He's Going In Circles from the Kaleidoscope collection to wear. I haven't had a chance to try it out yet and I was curious to see how different the holo flare is compared to traditional holos. 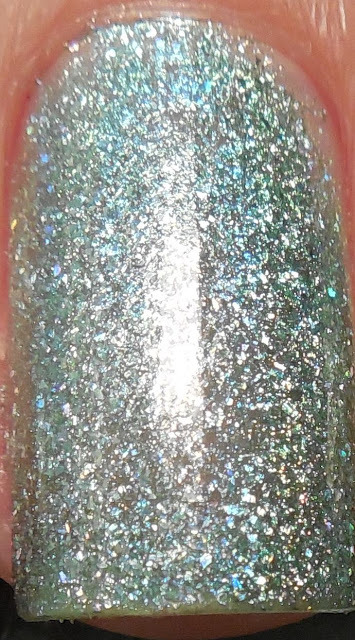 This particular shade is a light green holo and there seems to be larger spectraflair bits that are almost flake-like instead o the superfine spectraflair glitter that is normal for most holos. Application was typical of most holographic polishes but perhaps slightly less pigmented than most. The first layer seemed a bit sheer and streaky but it evened out after the 2nd coat. No topcoat in these photos. I like the effect that the larger holographic flakes make in this polish but it results in less of a holo flare. I think I prefer the traditional holos, such as those found in the China Glaze OMG or Color Club Halo Hues collection. Which do you like better?